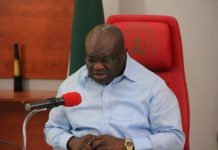 Rivers State Governor, Nyesom Ezenwo Wike has called on Nigerians to hold elected and appointed officials accountable, for them to deliver the dividends of democracy. 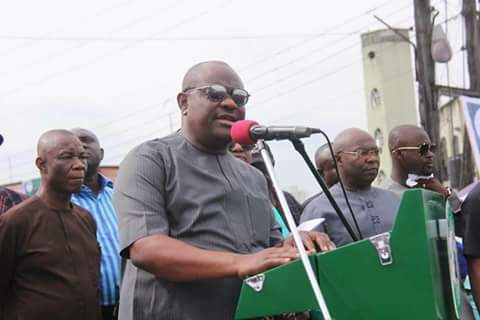 Flagging off the reconstruction of Eleme-Oyigbo road in Alesa-Eleme on Thursday, Governor Wike stated that Nigerians should no longer accept excuses from non performing public officers. He declared that 2019 is the best opportunity for Nigerians to end this era of suffering foisted on them by the failed APC Federal Government and her agents. He said: “My charge to Nigerians is that they must hold all public officials accountable. In 2019, before anyone campaigns, he must first show what he has done with his present office. “Gone are the days when people listen to flimsy excuses. There is no room for excuses anymore. This is not the time for empty promises “. Governor Wike stated he has used the people’s mandate to develop all Local Government Areas of the state, pointing out that Eleme Local Government Area has enjoyed key projects. “There is no local government area that I cannot walk freely, because I have projects everywhere. I have fulfilled my campaign promises and I will continue to deliver on the dividends of democracy “, he said. The governor said that leaders of the APC Federal Government have refused to work for the people because they rely on INEC and security agencies to rig elections. He explained that INEC and security agencies are the main obstacles to free and fair elections . Governor Wike revealed that the defeated 2015 APC Rivers State Governorship Candidate and Director General of NIMASA, Mr Dakuku Peterside wrote to the Federal Ministry of Finance demanding to know how much has been released to Rivers State since 2015.
to the State are published monthly by the Federal Ministry of Finance, with his administration applying all resources to the development of the state. He said that Dakuku Peterside as Commissioner of Works mismanaged state resources, while his administration is ensuring that the Ogoni-Andoni-Opobo-Nkoro Unity Road gets to Opobo by May. Commissioner of Works, Mr Dum Dekor said that the 11.5kilometers road will be completed in nine months, while 540 persons will be employed in the course of the construction. He urged Eleme and Oyigbo people to cooperate with the contractor to deliver road on schedule. 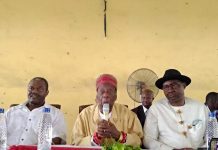 Spokesman for the Eleme Community, Mr Godwin Abe Olo thanked Governor Wike for his commitment to the development of the area. He said since the road was constructed in 1983, it has degenerated over the years. Highpoint of the occasion was the defection of 1000 APC supporters to the PDP. The Chairman of the PDP in Rivers State, Bro Felix Obuah assured the new PDP members of equal treatment within the party. Thousands of Eleme and Oyigbo people gathered to witness the flag off ceremony, which is a major road in the area.